On March 9, 1851, Danish physicist Hans Christian Ørsted passed away. 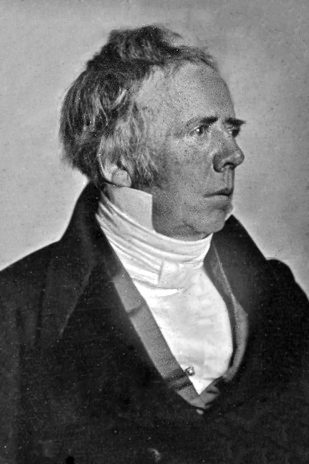 Hans Christian Ørsted discovered that electric currents create magnetic fields, which was the first connection found between electricity and magnetism. He is still known today for Oersted‘s Law and the oersted (Oe), the cgs unit of magnetic H-field strength, is named after him. Hans Christian Ørsted was born in Rudkøbing, Denmark, the elder son of an apothecary, Søren Christian Ørsted, and his wife, the former Karen Hermansen. As a young boy Ørsted developed his interest in science while working for his father. Thereby, already at age eleven, he began gaining a practical knowledge of the fundamentals of chemistry. He and his brother Anders received most of their early education through self-study at home, going to Copenhagen in 1793 to take entrance exams for the University of Copenhagen, where both brothers excelled academically. The most important of Oersted’s courses for his intellectual development was that offered on Kant and the critical philosophy. Oersted became a passionate Kantian and defender of Kant’s philosophical views, which were to be of fundamental importance to his scientific development. By 1796 Ørsted had been awarded honors for his papers in both aesthetics and physics. He earned his doctorate in 1799 for a dissertation based on the works of Kant entitled “Dissertatio de forma metaphysices elementaris naturae externae,” (The Architectonics of Natural Metaphysics), which states Oersted’s appreciation of the importance of Kantian philosophy for natural philosophy and, in addition, provides a clue to the two areas in which he was to apply his scientific training: electromagnetism and research on the compressibility of gases and liquids. In 1800, Alessandro Volta invented a galvanic battery  inspiring Ørsted to think about the nature of electricity and to conduct his first electrical experiments. In 1801 Ørsted received a travel scholarship and public grant which enabled him to spend three years travelling across Europe. In Germany he met Johann Wilhelm Ritter, a physicist who believed there was a connection between electricity and magnetism. Ritter was then publishing on the chemical effects of current electricity. He was able to focus Ørsted’s attention on the forces of chemical affinity and their relationship to electricity. Ritter’s highly unorthodox ideas on matter and force also stimulated Ørsted to develop his own concepts. This all made sense to Ørsted since he believed in Kantian ideas about the unity of nature and that deep relationships existed between natural phenomena. 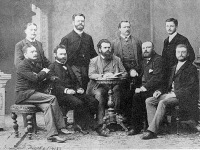 At Berlin, Ørsted read Schelling and heard Friedrich Schlegel. However, Ørsted was saved from the extravagances of a Schelling by his basic respect for empirical fact. Ørsted was drawn into the study of physics. 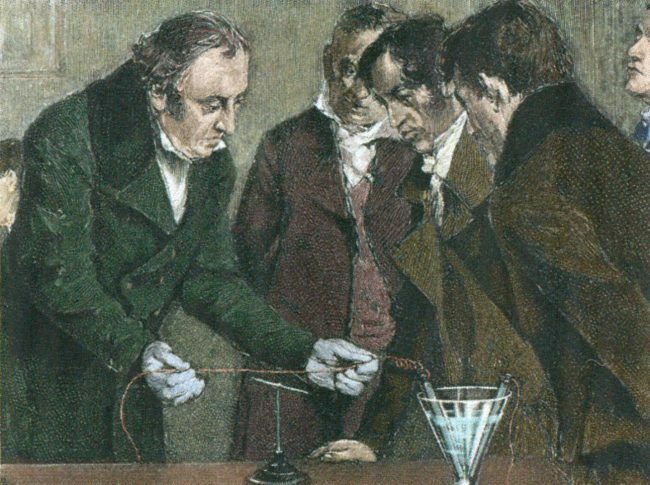 He became a extraordinary professor at the University of Copenhagen in 1806 and continued his research with electric currents and acoustics. He then began his own scientific work in earnest. A series of sober publications, among which was an excellent paper on acoustical figures (1810), gradually erased his earlier reputation. Under his guidance the University developed a comprehensive physics and chemistry program and established new laboratories. 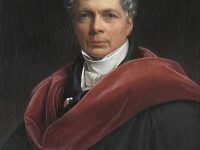 He became a full professor of physics in 1817 and served as rector in 1825/26 and 1840/41. Ørsted welcomed William Christopher Zeise to his family home in autumn 1806; taking the then young chemist under his care and giving him encouragement while offering him a position as his lecturing assistant. In 1812 he again visited Germany and France after publishing a manual called Videnskaben om Naturens Almindelige Love and Første Indledning til den Almindelige Naturlære (1811). In Berlin he wrote his famous essay on the identity of chemical and electrical forces in which he first stated the connection existing between magnetism and electricity. Then, in Paris he translated that essay into Latin with Marcel de Serres. In 1819 Ørsted isolated piperidine from black pepper for the first time and in 1825 he succeeded in producing aluminium for the first time by reacting aluminium chloride (AlCl3) with potassium amalgam. Oersted discovers electromagnetism in 1820. Engraving with later colouration. It is sometimes claimed that Italian Gian Domenico Romagnosi was the first person who found a relationship between electricity and magnetism, about two decades before Ørsted’s 1820 discovery of electromagnetism. Romagnosi’s experiments showed that an electric current from a voltaic pile could deflect a magnetic needle. His researches were published in two Italian newspapers and were largely overlooked by the scientific community. Ørsted’s findings stirred much research into electrodynamics throughout the scientific community, influencing French physicist André-Marie Ampère‘s developments of a single mathematical formula to represent the magnetic forces between current-carrying conductors. Ørsted, who was already inclined to adopt a holistic approach, immediately recognised the importance of linking the two phenomena and, with his publication of his findings, triggered the development of electricity and electrical engineering. The now obsolete cgs unit of magnetic field strength (abbreviated to Oe) was named after Ørsted. 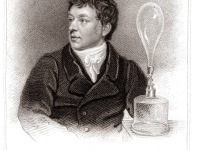 He also carried out research into the properties of liquids and gases, focusing on their compressibility. Ørsted first introduced the concept of thought experiment as a relation between mathematical and physical knowledge at Kant. However, the term is attributed to Ernst Mach, since Ørsted’s cantonal perspective remained almost without any influence on the history of the concept. In 1822, he was elected a foreign member of the Royal Swedish Academy of Sciences and in 1849 a Foreign Honorary Member of the American Academy of Arts and Sciences. The Royal Society of London gave him the Copley Medal and the French Academy awarded him with 3,000 gold francs. Ørsted was just 43 when he made this great discovery. He established the Royal Polytechnic Institute in 1829 of which he was the first director. Ørsted was a published writer and poet. His poetry series Luftskibet (“The Airship“) was inspired by the balloon flights of fellow physicist and stage magician Étienne-Gaspard Robert. Shortly before his death, he submitted a collection of articles for publication under the title “The Soul in Nature“. The book presents Ørsted’s life philosophy and views on a wide variety of issues. In his last years Oersted returned to his first love, philosophy. In a series of articles, published together in The Soul in Nature, he considered the relation between beauty and science. He still saw the hand of God in both. Beauty in art and music was the Divine Reason manifested in the harmonies of sight and sound. When Hans Christian Ørsted died in Copenhagen at the age of 73 in 1851, he was an acknowledged physicist, chemist and astronomer and is now considered one of the leading personalities of the Golden Age of Denmark. 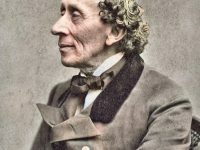 The writer Hans Christian Andersen (1805-1875) had a long-standing friendship with Ørsted and was influenced by his natural philosophical views. André-Marie Ampère and Electromagnetism, SciHi Blog, January 20, 2018. Alessandro Volta and the Electricity, March 20, 2013. Ernst Mach and the eponymous Mach Number, SciHi Blog, February 8, 2018. Hans Christian Ørsted, “Experiments on the Effect of a Current of Electricity on the Magnetic Needle“, Annals of Philosophy 1820, vol. 16, pp. 273-277.